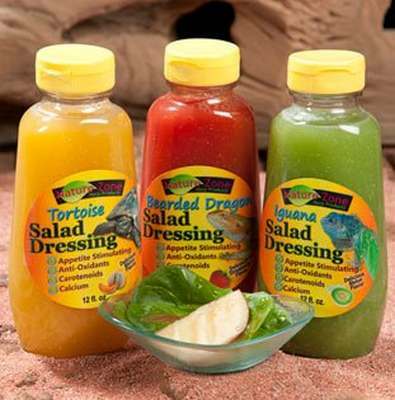 Why a Salad Dressing for Tortoises? A delicious addition to any tortoise meal whether it be a salad mix, dry or wet foods. Musk Melon flavor stimulates the appetite of a tortoise, and attracts them to try the mixed greens of a salad. Orange color is visually attractive to a tortoise, this in combination with the strong Musk Melon scent assures that ANY tortoise will be attracted and tempted to try the salad on first and every offering. Why the Salad Dress is especially nutritious for Tortoises? Soluble fiber has been added for the tortoises' digestive health. Adds micro nutrients, minerals, vitamins help guarantee the balanced nutrition of any salad mix. Adds phytonutrients (carotenoids, anthocyanidins, flavonoids) and found in various berries and flowers. Which help maintain natural colors in the tortoises' physical appearance.